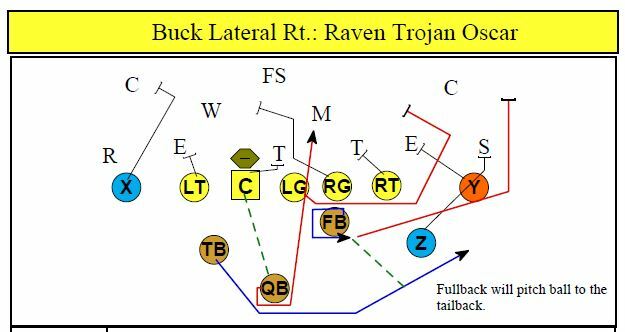 The Buck Lateral series consists of Tags because of the potential of handing the ball off to the fullback by the quarterback and then the fullback handing the ball off to another runner or ball carrier. 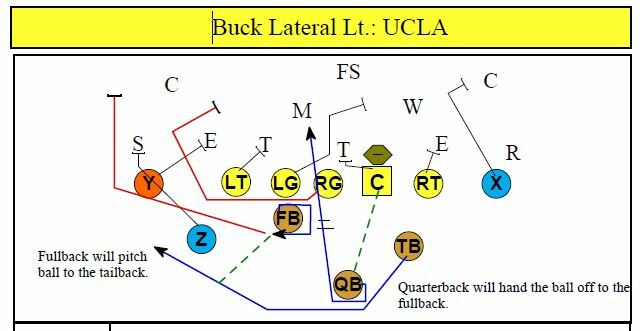 Once the Buck Lateral has been alerted in the huddle, it is now telling the fullback that he will be pivot off his outside foot and may be receiving a hand-off or carrying out a fake as if he received the ball from the quarterback as he runs by him. The fourth digit tells the back carrying the ball which hole he will be running through. Thus, the center will snap the ball to the quarterback because its a Buck lateral play the quarterback will do a 360 degree spin and then attack the L.O.S. handing the ball off to the fullback pitching the ball to the tailback running through the 8 hole. Thus, in this example the center will snap the ball to the quarterback because its a Buck lateral play the quarterback will spin faking the ball to the Tailback coming around keeping the ball running to the outside shoulder of the Fullback the ball will be handed off with his left hand and to the Fullback and the Quarterback running at the 4 hole Fullback handing off to the Tight End coming around (the tag alert) receiving the ball from the Fullback. X Release inside quickly working to the free safety, if it appears that you can’t get him turn and cut the pursuit of the corner to your side off. LT Sift through the inside shoulder looking for outside invert flowing over the top. Center Snap ball to the left knee of the quarterback, look for possible Ace combo with guard to backside linebacker. LG Drop step pulling wide and to the outside of the E.M.L.O.S., keying the playside linebacker, turn up on him he fills early. RG Block backside and look for possible Ace combo with center to backside linebacker. RT Block down an inside on first inside linebacker playside; don’t allow any penetration. Y Release down and inside cutting the near knee of the defensive end; don’t allow any backside pursuit. FB Do a half pivot on the outside foot with your back facing the L.O.S.. Receive ball from quarterback continue your spin taking your path down the L.O.S. and wide outside looking to read and pitch off the 9 technique. Tailback will get in pitch relationship with you. TB Drop step with inside foot, aim for near hip of the quarterback, fake receiving the ball and run wide looking to get into pitch relationship with your fullback. Option will probably take place past the L.O.S. QB Receive snap from center, spin , fake handing ball off to the tailback; continue through your spin running at the near hip of the fullback; hand ball off to fullback and keep running through the 2 hole. Z Drop step with outside foot aiming for the outside number of the E.M.L.O.S. continue to block defender until quarterback and tailback pass you up. LT Reach block man on if covered, if uncovered block first defender to your inside, don’t allow any penetration. LG Reach block man on if covered, if uncovered block first defender to your inside, don’t allow any penetration. RT Sift through the inside shoulder looking for outside invert flowing over the top. Y Reach block man on if covered, if uncovered block first defender to your inside, don’t allow any penetration. FB Do a half pivot on the outside foot with your back facing the L.O.S.. Receive ball from quarterback continue your spin taking your path down the L.O.S. and wide outside looking to read and pitch off the 9 techmique. Tailback will get in pitch relationship with you. QB Receive snap from center, spin , fake handing ball off to the tailback; continue through your spin running at the near hip of the fullback; hand ball off to fullback and keep running through the 3 hole. Z Drop step with outside foot aiming for the outside number of the E.M.L.O.S. continue to block defender until quarterback and tailback pass you up. X Release inside looking to cut-off the pursuit of the backside corner, don’t allow him to cross your face. LT Block man over if covered if not, block first defender to your outside. Center Snap ball to the left knee of the quarterback, look for possible combo with playside tackle to backside linebacker. LG Drop step with outside foot pulling shallow turning up the outside hip of the tight end looking to block the first opposite colored jersey of the first defender inside. 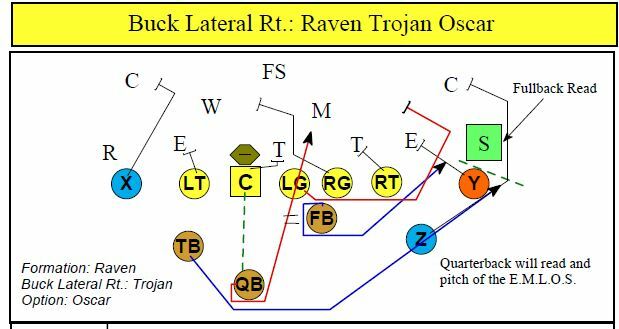 RT Block down an inside on first inside linebacker play side; don’t allow any penetration. TB Drop step with inside foot, aiming for the near hip of the quarterback; fake receiving the hand-off from the quarterback; swing wide through the 8 hole; just before turning up field, receive pitch from the fullback. 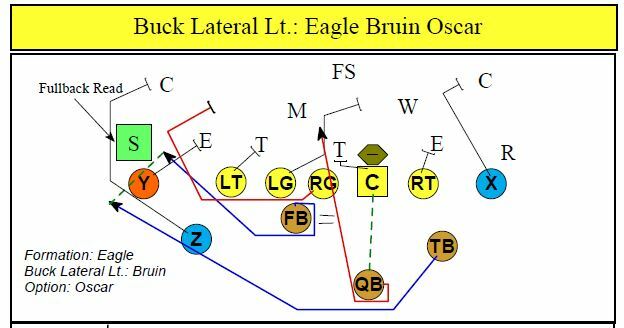 LT Block down an inside on first inside linebacker playside; don’t allow any penetration. LG Block backside and look for possible Ace combo with center to backside linebacker. RG Dropstep with outside foot pulling shallow turning up the outside hip of the tight end looking to block the first opposite colored jersey of the first defender inside. RT Block man over if covered if not, block first defender to your outside. Z Dropstep with outside foot aiming for the outside number of the E.M.L.O.S. continue to block defender until quarterback and tailback pass you up.